Exactly ten months since it took the country by storm, Dacia's already celebrating another impressive milestone, its 10,000 new customer. That's going some. Even by Dacia's usual growth spurt standards. the UK, which has arguably the most cut-throat new and used car market in Europe. Oh, and the fact that it almost exclusively focuses on retail business, which just happens to make up only around half of all car sales here in Blighty. The owner of the landmark car, Elma Marshall, an NHS worker at Motherwell Hospital, recently collected her gleaming Duster Ambiance 4x4, in sparkling Granite Grey metallic, on Scotland's east coast. Fittingly, the car was bought and handed over at Ness Motors, Perth, already one of the best-performing retailers in the country, by General Manager, John Aitken. 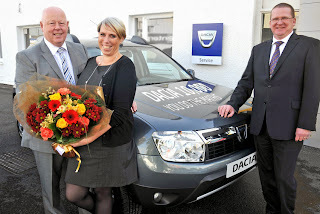 "I'd read a lot of things about Dacia on the internet before I went to Ness in Perth, and the fact that Duster was the Scottish Car of the Year also hadn't escaped my notice. As soon as I sat in it, I loved it. It was comfy and the chunky styling really reassured me that I'd be safe in the snowiest weather. I knew that by investing in even the top specification 4x4, I'd be saving thousands compared to anything else like it. One minute I was trading in a front-wheel-drive petrol Mazda 6, the next I was driving my diesel Dacia Duster 4x4 home. I've already had some lovely comments on the car from both colleagues in the NHS and family and friends in the farming community. I've even been approached by strangers at the garage!" said Elma. "I'm over the moon that Elma, as well as over 10,000 other Dacia owners, have recognised the 'shockingly affordable' value-for-money of Duster and Sandero in terms of space, practicality and equipment, so far this year. Our Dacia line-up has now been completed with the arrival of Sandero Stepway and Logan MCV, making us the first choice 'smart buy' car brand," said Ken Ramirez, Managing Director, Renault UK & Ireland.